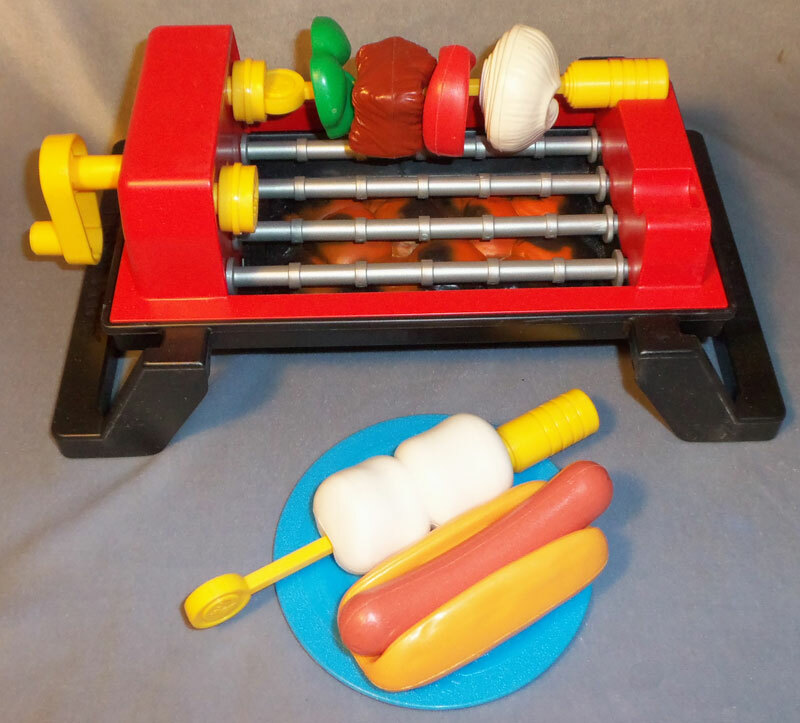 Description: This set comes with a black barbecue grill with a handle that turns the grill's rollers and accessory skewers. The grill makes a sizzling sound as the handle is turned. 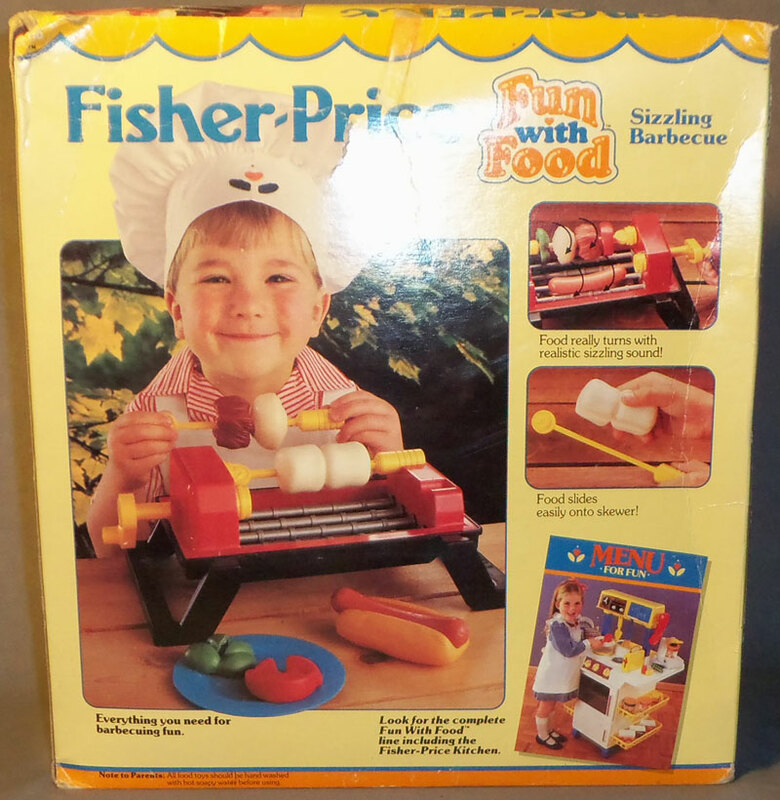 The set includes 2 skewers to "cook" shish kabobs or grill marshmallows. 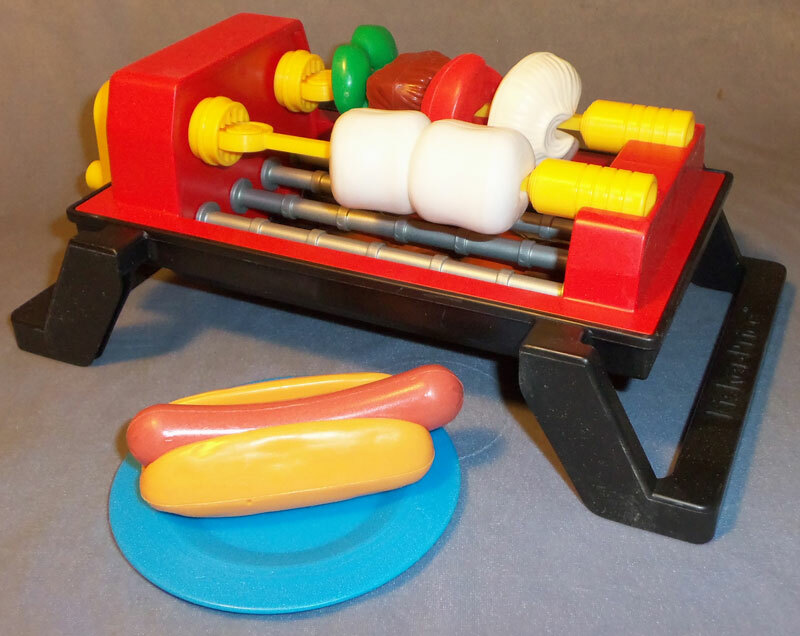 The set also includes a hot dog and bun. Designed for children ages 3 to 7 years old. FPT7085 - Red top, black base barbecue grill with yellow handle that turns 4 silver rollers. 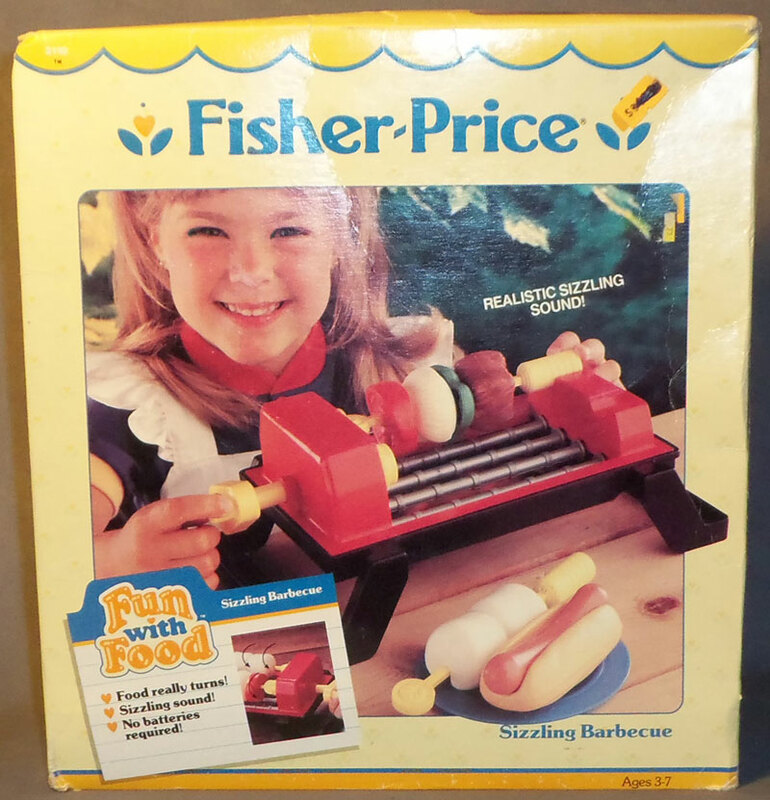 The grill top has 2 round yellow knobs beside the handle, and the opposite end of the grill has 2 half-circle indentions. The yellow knobs and half-circle indentions are designed to hold the #2110 accessory skewers. The grill makes a sizzling sound as the handle is turned. 2 each - FPT7086 - Yellow skewer that has a round handle on one end and a small round knot on the other end to prevent #2110 accessory food items from sliding off. Each #2110 accessory food item has a small hole through the center to allow it to fit over the knot and onto the skewers. The yellow knot has a flower design in the center of the circle. FPT7283 - Pinkish-red hot dog that is slightly curved, and has slightly split ends. FPT7089 - Light brownish-yellow hot dog bun with a rounded area in the center that a hot dog "snaps" into (snaps under raised bar on inside of each side of the bun - bars help hold hot dog in place). The bottom half of the bun has a molded seam around the sides and ends. FPT7090 - White marshmallows, 2 marshmallows molded together. The marshmellow has a narrow slit on each end to fit onto the #2110 shish kabob skewers. Measures 2-7/8" x 1-1/2" x 1-1/2". FPT7091 - Green bell pepper slice. One side of the slice looks like the top of a bell pepper, and the other side is flat as if it had been sliced. The pepper has a narrow slit in the middle to fit on the #2110 accessory shish kabob skewer. Measures 2" x 1-3/4" x 3/8". FPT7092 - Brown square meat chunk. The meat has molded sides that resembles a chunk of steak. The chunk has a narrow slit through the center to allow it to fit onto the #2110 accessory shish kabob skewers. FPT7093 - White "blooming" onion wedge. It looks like the end of an onion on one side with a rigid cut on the other side. The "cut" side looks like a blooming onion. The middle of the onion has a narrow slit in the middle to fit on the #2110 accessory shish kabob skewer. Measures 2" x 1-3/4" x 1-1/4". FPT7094 - Red tomato slice (looks like 2 wedges molded together in the middle forming a round "slice". This slice is not flat. The center of the tomatoe has a narrow slit to allow it to fit on the #2110 accessory shish kabob skewers. Measures 2" x 1-3/4" x 5/8". FPT7087 - Round blue plate with a slightly raised edge. The raised edge has a slightly textured top around the rim. The inside rim of the textured top has 2 smooth rings and a smooth heart with 2 "leaves" below it on 4 sides of the plates. Bottom center of plate is marked, "F-P TOYS". Measures 4-5/8" diameter.